Thirteen of the hottest celebrities in Hollywood are creating a buzz with an internet auction taking place in October, in order to raise awareness of one of the biggest and most pervasive threats to life on Earth. Ebay Giving Works, eBay’s program dedicated to charity listings, is hosting an online auction for the WWF, with 100% of the proceeds going to the World Wildlife Fund’s global conservation initiatives, especially those involved in the fight against climate change. The auction, which runs from October 3 -12, features a series of 100% organic T shirts emblazoned with the slogan “Hotter Than I Should Be”. 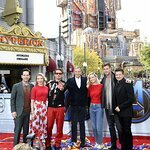 The shirts, which have created much interest in the media and Hollywood as a unique way to spread the message that the Earth is warming, have all been signed by a multitude of celebrities, including Scarlett Johansson, Orlando Bloom, Rachael Ray, Harrison Ford, and Cate Blanchett. The WWF is a leader in the field of climate science, and is a strong and persuasive advocate for the reduction of harmful greenhouse emissions and the increase of energy efficient technologies. For more than 45 years, the non-profit organization has been working to protect nature, and now provides cutting edge scientific research into areas of concern. With a dedicated team of experts in over 50 countries, the WWF focuses on 4 particular areas of impact: creating responsible global warming policies, working with businesses to reduce carbon dioxide levels, implementing adaptation plans to help the planet respond to climate change, and protecting the forests that help mitigate climate change. The “Hotter Than I Should Be” online auction looks set to provide some much needed funding to the WWF’s ongoing research. Many of the shirts have already reached bids of over $300, with Orlando Bloom’s attracting bids close to $800. Other celebrities who have lent their signitures to the cause include Candice Bergen, Gisele Bundchen, Kevin Bacon, Paul Newman, Charlie Sheen, Cindy Crawford, and Susan Sarandon. Unsigned “Hotter Than I Should Be” T shirts are also available with donations of over $50 to the WWF, and more information about the auction can be found at www.worldwildlife.org. Also up for auction on eBay Giving Works in October is a series of pink rubber bath ducks, signed and decorated by celebrities such as Courteney Cox, David Arquette, Lucy Liu, and Matthew McConaughey. The auction has been organized by Munchkin Inc, the makers of award winning infant and toddler products, as part of their Project Pink breast cancer awareness program, and runs from October 1 to November 4. All proceeds will go to Susan G. Komen for the Cure, a non-profit organization based in Dallas, Texas, dedicated to education and research into the causes, treatment, and the search for a cure to breast cancer. Other celebrities to design and sign rubber duckies include Brooke Shields, Desperate Housewives’ Marcia Cross, Charlie’s Angels’ Jaclyn Smith, and former First Lady Barbara Bush. The auction is hoped to raise over $30,000, and more information can be found at www.munchkin.com/projectpink.